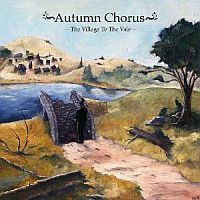 After releasing their debut album digitally last year, the young British post rock / post classical band were enticed by the offer of the Altr0ck/Fading label to release their album, The Village to the Vale, in physical form as well. And here we have it, in all its beauty, together with a very tasty booklet. The majority of the band grew up in rural surroundings, which is clearly evident in the music, which has a beautiful pastoral feel all the way through. Also, another thing you soon notice about the album is its continuous flow, which works almost hypnotically. There is great dramatic tension to the music, typical of post rock, with constant building of pressure until a climax and then they start all over again. The basic concept revolves around the standard rock idiom – guitar, bass, drums and vocals, but the addition of instruments like glockenspiel, trumpet, keyboards and strings give this album that extra push towards brilliance and gives it an almost classical feel (hence the post classical tag). Fans of progressive rock might hear hints of mellow King Crimson (Islands), Pink Floyd and Mike Oldfield among the post rock structures, which I’m sure will give the album much crossover appeal as well. The biggest asset this album possesses is its meticulous construction from tender beginnings to full-blown peaks, with one beautiful moment following the other. It’s hard to believe this is a debut album because I would attribute this kind of work and arrangements to seasoned veterans, but I suppose inspirations counts for a lot as well. This album is very much about the music as a whole. No instrument stands out, it is all crafted so that we have this glorious unit, which has no excess of information, but just the perfect amount of everything. Robbie’s vocals are also a perfect fit with their melancholy colour and a longing within them that’s hard to deny, occasionally also assisted by Thomas Feiner and Anna-Lynne Williams. This is a perfect album as a gateway to progressive rock for non proggers because it has some elements of progressive rock without all the things that make prog rock difficult to digest for some. it is also the perfect album to get prog rockers interested into post rock because while it contains elements of post rock, it also contains plenty of developments that prog rockers love so much. This is the album Sigur Ros could have done after Takk and the one I had hoped they would do. But there’s really no need now as Autumn Chorus have done it in their own way and better than in my wildest dreams – and with words that actually have meaning. These guys deserve the highest of praise. And if you don’t believe me, check them out for yourself!